Are you tired of working hard on your blog and not seeing results? Confused as to what things you should focus on? Do you secretly wonder why success seems to come so easily for others? If you want to blog full-time and work from anywhere, then you need to answer four key questions. Before we get into the four key questions, we must first address whether or not you should even start a blog. If you have wondered any of those things, then blogging could be the game changer for you. FREE COURSE: Ready to learn the 4-step blueprint to finding your 1,000 true fans? For a limited time, you can get immediate access to this $250 course for free: Influence from Scratch Course – How to Find Your First 1,000 True Fans. Most aspiring bloggers quickly get overwhelmed with all there is to do to build an audience online. They easily become distracted by the latest method, strategy, and technique. Before they realize it, they’ve started a dozen projects and finished none. The way out of overwhelm is to go back to the fundamentals. 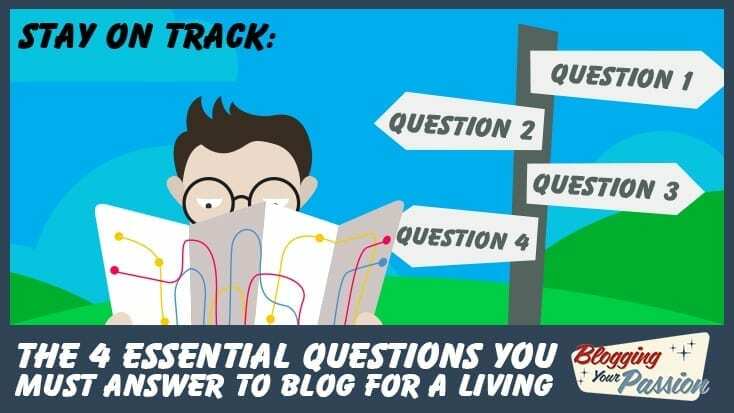 There are just four questions you must answer to blog for a living. There are just four questions you must answer to blog for a living. Question 1: Where Am I? If you haven’t launched your blog yet, stop researching about launching a membership site. Focus on launching your blog. If you’ve recently launched your blog, stop trying to build a presence on every social media site. Pick one and go deep for ninety days. Many new bloggers make the mistake of trying to master skills they don’t even need yet. Remember Super Mario Bros? As a kid, I loved playing Super Mario Bros. on my classic Nintendo. Like most video games, each level you reached required you to advance your skills. The same is true with blogging. You only need to master the skills for the level you at are right now. In all of our courses, we have our students self-identify which level of blogger they are. Doing so gives them clarity and focus. Which level of blogger are you? Knowing which level of blogger you are helps you to answer the next question. Question 2: What Do I Need to Do Next? Once you know which level of blogger you are, you can have absolute clarity as to what to do next. Instead of trying to do everything now, you settle in for the journey. You understand that building a blog business is a marathon and not a sprint. Are you beginning to see why focus is so important? Once you have a clear goal, you have permission to procrastinate on everything else. Question 3: How Do I Overcome Detours and Obstacles? Success is never achieved in a straight line. Every mountaintop story of success is paved with the path of failures. Every mountaintop story of success is paved with the path of failures. Nothing goes as planned from the start. Progress can often feel slow and things can get confusing. You’ll probably come face-to-face with an obstacle you didn’t foresee. And as usual, forces outside of your control will find you. The fastest way over, around, under and through your obstacles is to have a guide. With a guide, or mentor, you’ll get further faster. You can borrow their confidence when you have none. You can adopt their optimism when you’ve lost yours. Do you have a guide to take along on your journey? Question 4: Who Should I Take Along on My Journey? Besides a guide, you are going to need to travel with a community. Building an online business can be one of the most isolating pursuits you’ll ever encounter. If there’s one thing that has contributed to my success over the years, it’s being plugged into a community. Ever wonder why it’s so easy to see solutions to other people’s dilemmas, but have no clue as to how to overcome yours? That’s because we need an outside perspective. Are you attached to a group of passionate people who are headed in the same direction as you? Once you are able to correctly answer these four fundamental questions, you are on your way to building the lifestyle business of your dreams.